Someone is starting the new year $437 million richer, after the winning ticket was sold in a Glen Head deli. Greg Cergol reports. Just one winning ticket for the $425 million jackpot in Tuesday's Mega Millions drawing was sold -- and once again, the big winner was purchased in New York, according to the state lottery. The ticket was sold on Long Island at Brookville Auto Service Shop in Glen Head. The New Year's Day drawing was the eighth-largest jackpot in the history of the game. The cash option for the jackpot is $254.6 million. Tuesday's winning numbers were 34, 44, 57, 62, and 70. Mega Ball was 14. 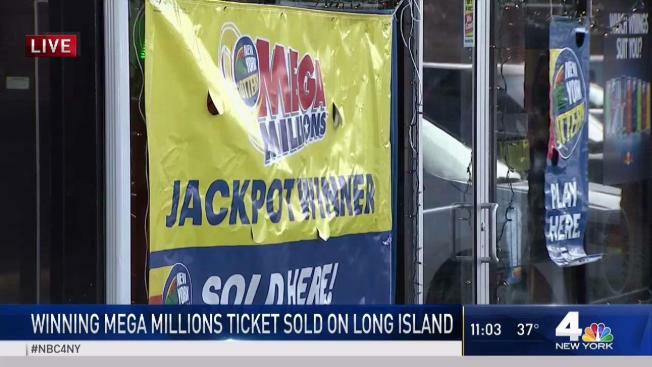 Between Mega Millions and Powerball, it was the sixth major lotto jackpot won in either New York or New Jersey since the end of March. On Dec. 26, a lone jackpot ticket sold in Brooklyn won the $298.3 million Powerball. That jackpot has yet to be claimed. In late October, some lucky Manhattanite was one of two people to hit the $687.8 million Powerball jackpot, the largest in New York state history. Prior to that, in August, a $245.6 million Powerball ticket was sold on Staten Island; in May, a $315.million Powerball ticket was sold in Little Ferry, New Jersey; and in March, someone hit the $533 million Mega in Vernon, New Jersey. The next Mega drawing will be held Friday, Jan. 4, with a starting value of $40 million. So, um, buy in the tri-state area.